Burgess signed the 40.2m motor yacht Miss Rose for sale at the end of May, and now Amy Houlston tells me that her price has been reduced by $1 million. Built by Taiwan's Horizon Yachts in 2008, she is the first in their P130 series designed by Juan Carlos Espinosa. MCA compliant, she has a sophisticated and voluminous interior with classic styling throughout. Her vast sundeck offers plenty of space to bask in the sunshine, unwind in the Jacuzzi, or dine with panoramic views. The Owner's deck offers a wonderful space for evening cocktails, or a shady haven to relax. The main deck has a second exterior dining area which links the outdoor communal areas back into the cosy yet elegant main salon. Accommodation is provided for 10 guests and includes two master cabins. The first is located aft of the upper deck and boasts a whirlpool bath, his and hers sinks and an office leading out to the exterior deck space. The second lies forward on the main deck with his and hers en-suite bathrooms and a large walk in wardrobe. On the lower deck are two VIP cabins, one with a queen size bed and the other with a king size bed which can be converted to two twins. The fifth cabin consists of a single berth with an additional Pullman. Having just completed an extensive 'top to bottom' yard period with considerable investment from her owners, she is in immaculate condition, and with her proven charter business could generate revenue for a new owner from Day 1. 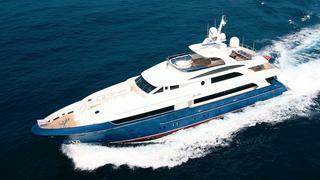 Miss Rose is now asking $12.9 million, down from $13.9 million. She is on display at the Cannes Boat Show this week.